Israeli scientist Daniel Shechtman has won the Nobel Prize in Chemistry for his controversial discovery of non-repeating patterns in atoms called quasicrystals. He is the third Israeli to win the award in chemistry, and the 10th Israeli to win a prestigious Nobel Prize in the country's 63-year history. 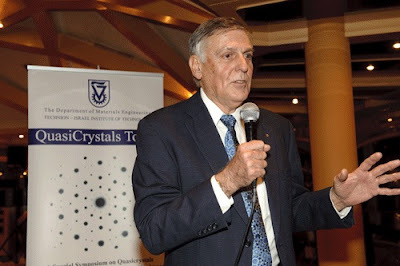 The Nobel Committee for Chemistry at the Royal Swedish Academy of Sciences said Shechtman, a professor at the Technion-Israel Institute of Technology in Haifa, had discovered quasicrystals, that appeared to be like "fascinating mosaics of the Arabic world reproduced at the level of atoms" and which never repeated themselves. Shechtman, who was born in Tel Aviv in 1941, had to fight hard for his science. He received his undergraduate and post-graduate degrees from the Technion, and joined the faculty in 1975. It was while he was on sabbatical at John Hopkins University and working with the National Bureau of Standards in 1982 that he discovered a startling anomaly in the atom patterns of a quasicrystal, a metallic alloy. In 2009, Prof. Ada Yonath of the Weizmann Institute of Science in Rehovot won the Nobel Prize for Chemistry for her ground-breaking work in understanding how cells build proteins. She was just the fourth woman to win the prize in chemistry. Yonath, who is the head researcher in the field of structural biology and biochemistry at the Weizmann Institute, is widely considered the pioneer of ribosome crystallography. Her research, carried out over a 25-year period, has revealed the modes of action of over 20 different antibiotics that target bacterial ribosomes. Her research lays the groundwork for scientists to start developing new bacteria-resistant antibiotics that better target the ribosomes of pathogens to avoid the problem of resistance. Other Israeli Nobel prize winners include Israeli mathematician Yisrael Robert Aumann, who received the Nobel Prize for economics in 2005 for his work on conflict and cooperation through game theory analysis. Other notable Israelis who have won Nobel Prizes include Prof. Daniel Kahneman, who won in Economics in 2002 and Profs. Avram Hershko and Prof. Aaron Ciechanover of the Technion, winners of the Prize in chemistry. Three Israeli politicians have also won the Nobel Prize for peace - Menachem Begin in 1978, and Shimon Peres and Yitzhak Rabin in 1994.